Preheat oven to 375°F and line two baking sheets with silicone baking mats or parchment paper. Open the Pillsbury™ Refrigerated Breadsticks can and take out the dough. Gently place 6 breadsticks on each baking sheet and twist them in a spiral fashion. Once you've twisted them in a spiral, sprinkle cheese all over the top. You can press the cheese down if you want too. Bake for 11-12 minutes or until cheese is bubbly and starting to brown. Remove from oven and let cool for a few minutes before serving with warm marinara sauce. When throwing a party, I like to think about what my guests would love to eat as well as having something easy enough so they don't get the food everywhere. I also think about the time that it’ll take to cook the food the day of so I'm not running around like a crazy maniac trying to make elaborate dishes and fail! 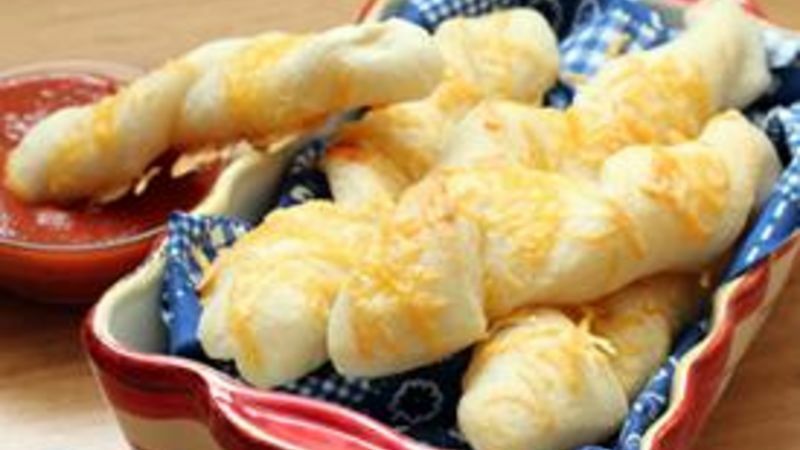 Cheesy breadsticks are fun and easy to make. If you have kids, you can get them to help you twist the dough and sprinkle on the cheese! Best part…they’re portable, so your guests don't have to stand at the table eating. They can dip and go! I also think cheesy breadsticks are a delicious alternative to having dinner rolls and they're ready in no time! Put the dough on the two baking sheets and twist! Bake for 11-12 minutes, or until the cheese is bubbly and golden brown. Remove from oven, let cool for a few minutes, and then serve with Muir Glen marinara sauce!